Kenyans who like speaking as speakers adress social events and functions now have a reason to smile, or more precisely to chatter away even more. This is after the launch of the Samsung Chatter application in Kenya. The product was launched by Samsung Kenya deputy Managing Director, Robert Ngeru, on Tuesday evening at Mercury lounge at the ABC Place, along Waiyaki way. Fareed Khimani was also present at the event, however, for a different launch of the Samsung Galaxy 2 in the country. The lounge was overflowing with invited guests comprising of members of the media, various mobile phone retailers, other industry executives and bewildered bloggers who retreated to a dark corner. The lounge was overflowing to a point that the waiters and waitress were simply overwhelmed by the orders. Ngeru says the Chatter application is best suited for evening events and social functions. "Samsung Chatter works well with an open bar (free drinks), it is very hard to quieten attendees when using the application, " he said. 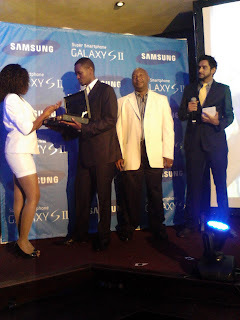 To demonstrate the success of the application, Ngeru and Fareed later attempted to launch the Samsung Galaxy S2 (Follow the link for the full story on the Samsung S2 launch in Nairobi) . Not even the awesoneness of the device nor the news of the device selling more than 5 million devices could draw the patrons from the chatter. One, member of the fourth estate said, "I was struggling to hear what Ngery was saying, but it's like we were in a cage amidst excited monkeys. " Meanwhile, some members of the fourth estare were also turned away from the invite only event. The organisers blamed this on the small size of the lounge and the fact that those turned away work for media houses and media agencies that are so unknown that they are perceived to be in the fifth estate.